LB-KVM 1700- industrial Monitor Keyboard is the solution for compact-ing more computing power into limited space. This revolutionary monitor keyboard combines a spectacular display coupled with a keyboard with built-in pointing device in a compact unit that measures only 1U in height. Occupying a fraction of the space of traditional monitor and keyboard units, the installation of the DMK leaves ample space for other critical components. 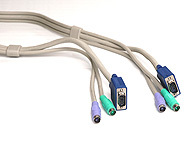 With built-in analog-to-digital conversion board, the DMK can be connected to any standard VGA graphics card for immediate On Screen Display. The monitor key-board unit has a built-in slide rail and mounts easily onto any 19" rackmount cabinet.